Collingwood's Grace Darling may use a bit of a daggy name for their discount food night - Tightarse Tuesdays - but their meals are all class. Diners hit the jackpot when an establishment offers dishes off their regular menu at a bargain price. At the Grace the same menu services the bar and restaurant, so you can choose your level of ambience and whether you want someone to take your order (including for drinks) or you want to take it to the bar yourself. The dining area at the back of the building is hardly pretentious, and its downstairs 'atrium area', with a glass roof and decorated with ferns and straw partitions, feels more like a beer garden. The main meal prices range from $10-15. The Grace runs a dedicated steak night on Thursdays, but a red-meat-fix is also available for $14 as part of the Tightarse Tuesday menu. Alternatively, their steak sandwich with fries is also a winner. The chicken burger with avocado, brie and hollandaise sauce is a standout. 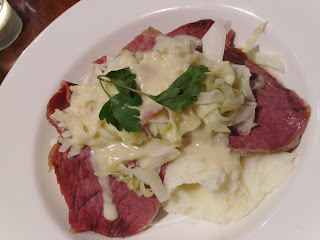 Feeling cosy, warm, buoyed by socialising on a Tuesday and liberated by the range of great food at a good price, I went left of my usual field and ordered the corned beef, with mash, cabbage, bacon and mustard sauce. It looked a treat on the plate: several slices of meat, not too thick, positively glowing with pinkness, but looking firm and fresh; no sign of that glossy sheen on cured meat that indicates it's past its best. On reflection I was a little surprised at the inclusion of bacon with the meal: corned beef tends to be a fairly salty serve on its own. Fortunately this sample didn't taste like it had been sitting in brine since the pub's namesake rescued the survivors of a shipwreck in 1883! Each of the meal's components contributed to make a whole that was more than the sum of its parts. The mash was particularly straightforward - not overly creamy nor buttery nor herby, it tasted pretty much like, well, potatoes that had been mashed! - and the mustard sauce was more of a mayonnaise. But piled up in a forkful with with the crunchy cabbage and pliable meat it made for an enjoyable home-style meal. 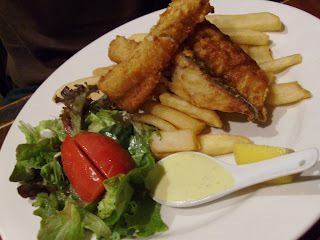 SG chose the beer-battered fish and chips. How cute is the spoonful of tartare sauce? Rather than one great slab of fish with a puffy batter, the Grace serves up three smaller, firm fillets, each more dusted than dunked in the batter. I've never found fault with their fries, and these steak-cut chips were just as crunchy and irresistible as ever. If you haven't overdone it on fries and still have room a range of desserts - such as orange bread and butter pudding ($7.50) - is available. What is most notable about the Grace's Tightarse Tuesday is that it's only the prices that are cut back. There's still a good choice of food - the range extends beyond traditional pub grub to include restuarant-style dishes (such as prawn risotto) - and the serving sizes are generous. There is also ample seating and the service is friendly and attentive.